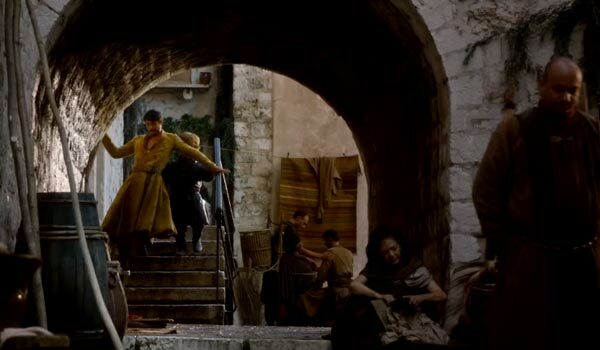 We still have more than a month before HBO’s Game of Thrones returns to the schedule for Season 5. Luckily, HBO Home Entertainment has tided us over with Game of Thrones: The Complete Fourth Season Blu-ray set, and now they’ve made an amusing blooper reel available for our perusal. It’s pretty funny, so be sure to check it out, below. While the blooper reel is spoiler free, the text after gets into a few plot details. Keep that in mind before reading on! As Game of Thrones is known for its wit more than its outright comedy (although it can be amusing), it’s only fitting that most of the bloopers in the video are related to some sort of flub. There are a lot of requests for lines, and a lot of other flubbed lines leading to curse words from the actors. But among these very mundane moments are a slew of amusing shots from the set. In one memorable scene, Margaery is attempting to seduce Tommen after her bid for the crown is initially foiled by Joffrey’s untimely death. Hilariously, while shooting the very serious segment, a cat jumped into the picture. Pedro Pascal, who played Oberyn Martell a.k.a. The Viper during Season 4, pops up several times during the blooper reel. In one instance, the actor has a coughing fit when he’s the middle of an intense conversation with the lion, Tywin Lannister. In another bad moment, he has some major trouble with a set of stairs. Poor guy. If you haven’t caught the fourth season of Game of Thrones yet, the season is among the best so far, featuring plenty of shocking deaths, as well as a goodly amount of political intrigue. The Complete Fourth Season Blu-ray and DVD sets are a great way to revisit the series, and come with a slew of bonus features, including “The Fallen: A Roundtable,” which features interviews from all of the characters who were killed off last season. If the Season 4 Blu-ray release isn’t enough to tide you over, you don’t have too long to wait until Season 5 hits the schedule. The new season has been shot, and will premiere on HBO on April 12. There are a ton of new storylines to be explored and characters to be introduced in the new seasons, and you can check out everything we know so far.